With the advancement of technology, film screening in cinemas has gone digital and film reels no longer stack up in screening rooms. The rotating motion of film reels was adopted as the theme for this cinema interior, visualised in an impactful and modernistic film-viewing environment. In the lobby, film reels are portrayed as huge round plates with a diameter of 2.8 metres, embodying an enormous and powerful ceiling feature. The wood pattern and the lighting effect together create a sense of movement and suspension, resembling film reels frozen in the midst of rotation. Stones in two shades of brown have been used as flooring. The linear floor pattern enhances the sense of movement exuding from the ceiling, imbuing the space with a dynamic atmosphere. In the rest area, sofas and coffee tables feature in dark green, evoking a sense of elegance and calmness. 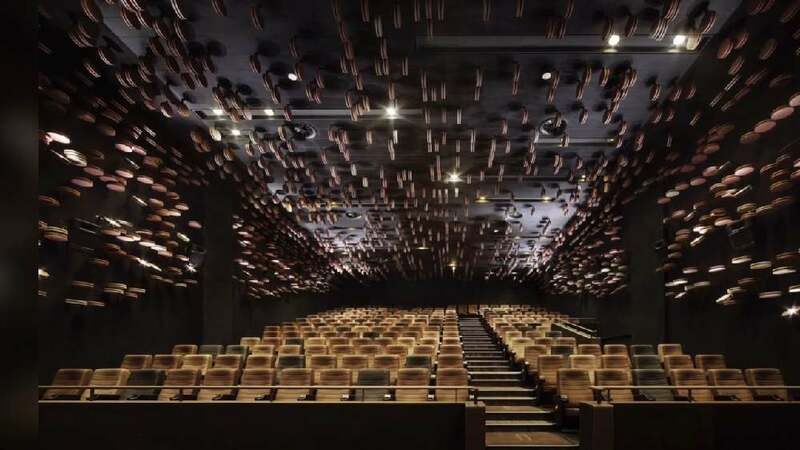 Furthermore, the auditorium ceiling and walls are covered with small brown discs made from sound absorbing panels to look as if film reels were flying towards the audience. The interior design of this cinema impresses with an exceptionally powerful staging comprising huge round wood plates that symbolise old film reels as a classic symbol of cinema art. Mounted unevenly onto the ceiling and sublime in appearance, they define the room ambiance. Together with the refined brown stone floor and seating corners in elegant green, they project a unique experience.